Don't forget - Vote for the 2nd Best Blog of 2014 here, and visit Sooz for the 2014 Bip Awards here. I've said it before - I have a great LCS. Great owner and workers to chat up, along with the regulars. Loads of cards to pick from, whether new wax or old commons. 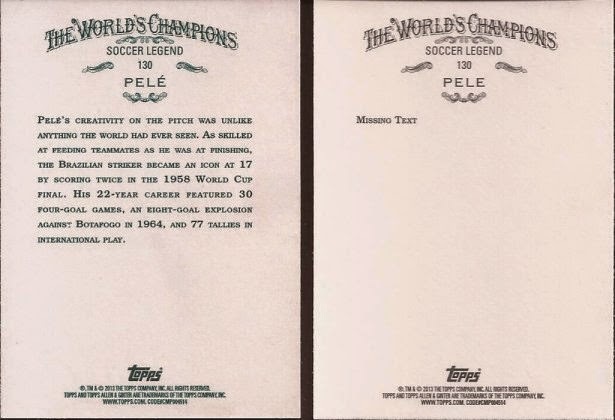 Hell, considering some of you readers, I could have a hole in the wall stacked with boxes of '87 Topps, '90 Score and '92 Upper Deck and I would be way ahead of the game over the places you get to visit. Last weekend, Brain ran a trade day. If you have cards to trade you can come in to wheel and deal with other people, and even sell. It's the only time he'll allow exchange for cash within his store. I stopped by to see some of the goods people have, but mainly to dig through his commons. From what Brian and Chris (his son) say, there are stacks of boxes in the back that need to be sorted and organized. They finally have enough space on the floors to get all the current product properly displayed, and have started to work on the pallets of cards. I figured it was a good a time as any to work on some earlier Sox team set needs. So I grabbed boxes and started digging. Filled some holes from 71-75. 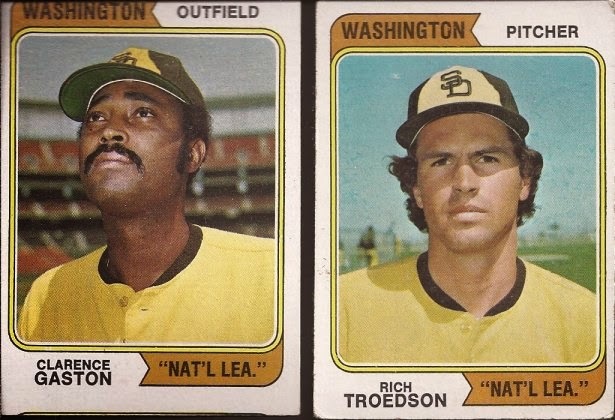 I completed a couple sets recently, and I am very close to knocking out some of the earlier 70s Topps sets. I am always open for help, so if you have Topps ChiSox from the 50s-80s, my team set needs can be found at the top of the page. I dug. Most of the boxes we in order, but if I jumped to the card number I needed, I would miss some prime binder cards like these. Great view of Yankee Stadium behind pre-Yankee days Graig Nettles, a classic double play image from the '73 set, and Llenas faking a bunt. A couple nice miscuts. The rare duel binder card with Auerbach being a miscut bunt. Sonny is a fine parallelogram. 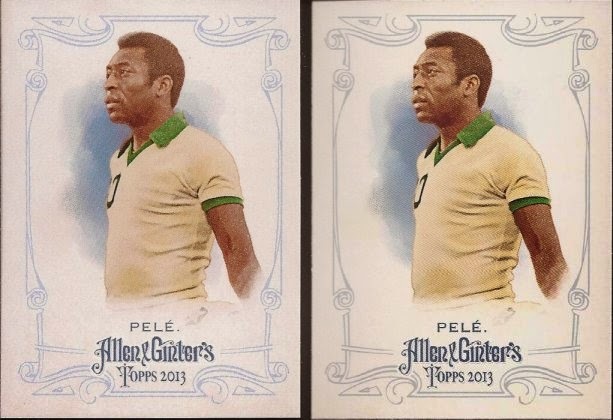 Hey Topps....there's a diecut idea for ya! Last of the vintage are my first two "Nat'l Lea." Padres cards. 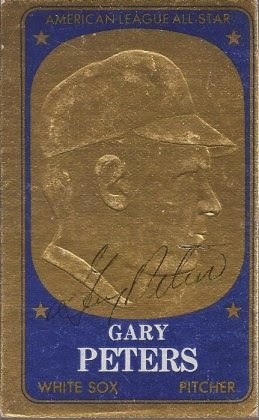 Have been wanting one of these for a long time, so when I pulled them out of the '74 commons box it was a no brainer. Gaston is miscut, but I think I will keep it separate, at least until I get a replacement. Yeah - two 2013 A&G Peles. I bought the one on the left. If you look close, it's a little whiter than the one on the right that I pulled from my set. Why? I have two of the missing text cards, but none of the bio cards, so I picked up the card for two quarters. Last two pickups were autographs I couldn't pass up. 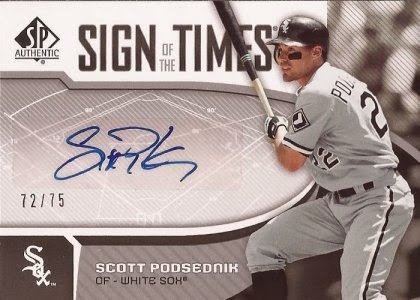 Ebay has a lot of Podzilla's autograph cards, but they are always him as a Brewer. For Project 2005, I am trying to get the players on cards dressed as White Sox, so I jumped on this for $3. According to the web, Scott is a tough autograph get. Not too bad for a little hole in the wall, eh? 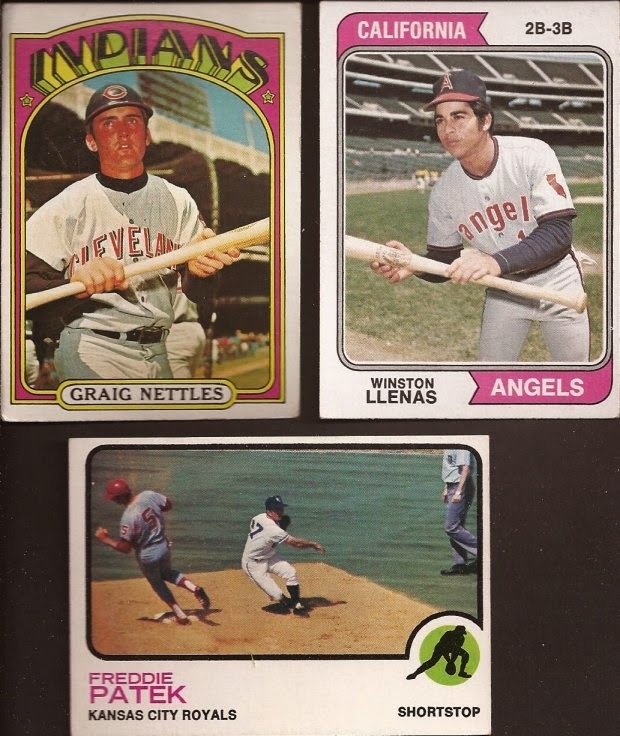 I don't remember seeing the Nettles '72 card. 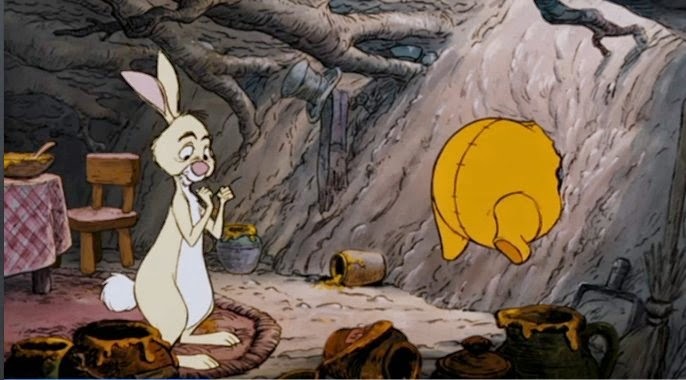 It's just great. Love that Indians uni with the drop shadow arched city name. They wore that in 1970 and I saw the Indians play at Yankee Stadium that June, a daylight Wednesday doubleheader. I'd like to think I was there when they took that picture! Great pickups! 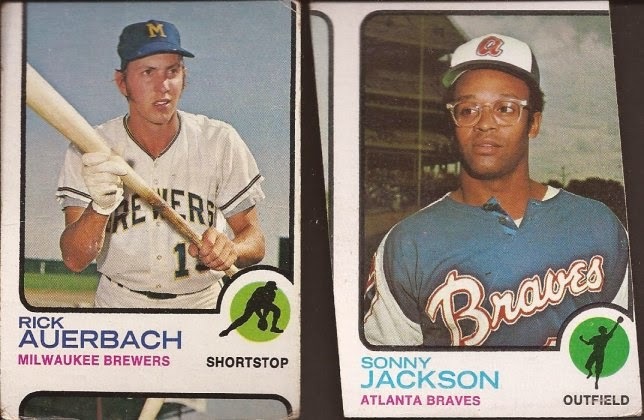 That '74 Dent rookie will probably be on my Top 100 Vintage Countdown if I ever get around to making it. Santo might have a shot as well. Damn you and your nice local card shop.